A two headed pig was born in China this week, according to news reports. 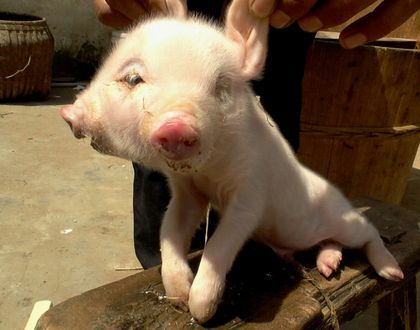 A two headed pig born in China. Photo taken on April 10th 2013. The deformed pig born in China’s Jiangxi Province and has two snouts two ears and a shared eye. A local vet says the pigs chances of reaching adulthood are rare, but its owner has agreed not to send it to the slaughterhouse. The pig suffers form a condition known as polycephaly. See more two headed animals.